India appears to be waiting for Pakistan to blink on Kashmir. 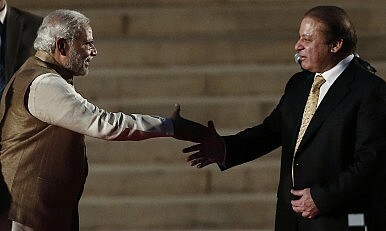 India’s new government has sprung two back-to-back surprises on Pakistan: the first was inviting Pakistan’s Prime Minister Nawaz Sharif to the swearing-in of Prime Minister Narendra Modi; the second was the about-face on foreign secretary level talks upon the resumption of dialogue. The first of these was seemingly couched in Indian regional diplomacy, but was mainly directed at Pakistan. The message was that with a new right-leaning government in New Delhi, Pakistan could expect bolder movement on the outstanding issues between the two. However, the second stemmed from the new government’s reluctance to be brought to the negotiating table under Pakistani pressure. There were an estimated 95 incidents along the Line of Control (LoC) this summer, with 25 on the international border (or “working boundary,” according to Pakistan). In this event, the Pakistani high commissioner’s meeting with Kashmiri separatists, something traditionally acceded to by India, provided the pretext for the cancellation. It was India’s message to Pakistan’s “miltastablishment,” to use former Punjab Chief Minister Najam Sethi’s phrase, that force will not work, particularly on a new government with a “tough” self-image. India’s outstretched hand in the Rashtrapati Bhawan (Presidential Residence) forecourt appeared promising for the peace constituency in Pakistan, which comprises liberals and the business lobby. It is a longstanding Indian policy to expand the peace constituency by holding out economic benefits as an incentive for Pakistan to go beyond the Kashmir question. Cancelling talks was unhelpful in empowering the peace lobby relative to India-skeptics in Pakistan. It is apparent that India’s strategy does not rely on this constituency’s ability to marginalize hardliners. The cancellation and the manner it was done together suggest India’s intent to bring about change through other means. In a speech to troops while in Leh, Modi pointed out that the Pakistani military’s shift to a proxy war was due to India’s conventional advantages. Obviously these advantages have not been so overwhelming they could deter a proxy war. The ability to administer military punishment was found wanting when it was tested during the 2008 Mumbai attacks. Even though India has had a conventional doctrine for the nuclear age, called Cold Start, since the attack on India’s Parliament in December 2001, the military’s wherewithal to execute its policy could not keep pace given the strained economic circumstances during the later part of the last decade. Deterrence deemed insufficient, India is now attempting to compel. India is expected to import $250 billion in arms over the next ten years. It is filling in the gaps in its conventional inventory, such as artillery, to remove any doubt of credibility about its conventional deterrence. The amount of foreign investment allowed in defense manufacturing has been upped to 49 percent. Since assuming office, the prime minister has visited Jammu and Kashmir twice, addressing troops on both occasions. Additionally, keeping the defense portfolio without a full-time minister has allowed Modi to keep a closer eye on it. Three warships have been commissioned in close succession, although two of them are reportedly not quite ready. The buildup on the Chinese front, reviewed most recently by the part-time defense minister in August when he visited the mountain strike corps forming there, could prove useful on the western front too. Carte blanche has been given to the Army and the Border Security Force by respective ministers to administer a “befitting reply” on the LoC and international border. Within this flurry of activity is couched a message for Pakistan. Thus far, Pakistan has been upping the ante in the hope of getting India to move on Kashmir. This time around, India hopes to increase pressure to get Pakistan to forget Kashmir. Pakistan, for its part, has a counter-strategy of ensuring that it is always in a position to credibly show itself in conflict with India. All it needs to do to win is to avoid losing. Further, its moves on the nuclear front are meant to convey the threat of escalation. This places India’s conventional threat in question, as it is based on keeping any conflict non-nuclear. Indeed, a paradox emerges in that the more successful India is in its armament program, the greater is the probability of Pakistan’s proxy war challenge heightening at the lower end of the conflict spectrum, and the nuclear shadow lengthening at the upper end. In Rawalpindi’s perception, with the U.S. set to exit Afghanistan and “good behavior” on Kashmir over the past decade not having “worked,” it may be back to business. Besides, it might be better for Kashmir to act as a sink for surplus Islamist energy than Pakistan’s cities and Punjab. The spike in firing incidents since talks were cancelled suggests as much. India could also undertake a proxy war itself, an accusation Pakistan has made before, most notably at the Sharm-el Sheikh joint statement in Egypt. The appointment of an intelligence czar as India’s national security advisor is an indicator. Afghanistan readily lends itself as a suitable site for such an endeavor. Any such conflict would certainly spill-over into Pakistan. In India’s calculation, placing Pakistan on its back foot could make it less adventurous in Kashmir. A strategy of overawing Pakistan is dangerous. Four potential proxy wars threaten: in Afghanistan, its spillover into Pakistan, in Kashmir, and in Islamist terror in India; this last heightened by al-Qaeda leader Ayman al-Zawahari’s latest video. At the same time there would be conventional and nuclear muscle-flexing by both sides. Given such dangers, India and Pakistan would do well to restart the peace process at the earliest opportunity, during the two prime ministers’ appearances at the U.N. at the end of next month. At the least, it would reinsert a buffer between crisis and conflict. Realistically, this may not be on the cards. India, set on upping the ante, may have decided to hold course no matter what. In this game of chicken, it hopes Pakistan’s army will be the first to blink. This is a touching, if entirely unfounded, faith in Pakistan’s army. Ali Ahmed is author of India’s Doctrine Puzzle: Limiting War in South Asia. He blogs at www.ali-writings.blogspot.in. The views expressed here are his own.